Angie Manigault’s stand displays her beautiful baskets. The ones with tails are starters. The U.S. highway 17 widening project in Mount Pleasant goes right through the middle of the Gullah Geechee Cultural Heritage Corridor, which extends from Wilmington, North Carolina, to St. Augustine, Florida, and was designated as a National Heritage Area by Congress in 2006. The Gullah Geechee Cultural Heritage Corridor began with one man’s idea. In 1992, the National Park Service assigned Michael Allen to what would become the Charles Pinckney National Historic site; he’s now stationed there as a community partnership specialist. Inspired by a missing aspect of Southern history he noticed as a college co-op student working at Fort Moultrie and Fort Sumter, Allen wanted to ensure that the African- American side of the story was included at the Lowcountry’s national parks. While working with the community to weave that story into the development of the Pinckney site and the area’s other parks, Allen realized the historic footprint of the African culture reached further than first anticipated, and what is now U.S. Highway 17 was the path it used to expand in the 1700s and 1800s. Word of the investigation into West African influences on the Lowcountry reached U.S. Rep. James E. Clyburn, who put some muscle behind the project. In 2000, the appropriations bill he sponsored passed the U.S. Congress, and the National Parks System’s Lowcountry Gullah Study began. 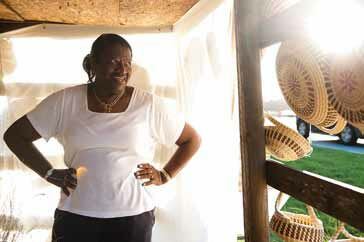 In 2006, the results were presented to Congress, and the Gullah Geechee Cultural Heritage Corridor was established with a mission to preserve, protect and sustain this part of the American experience. 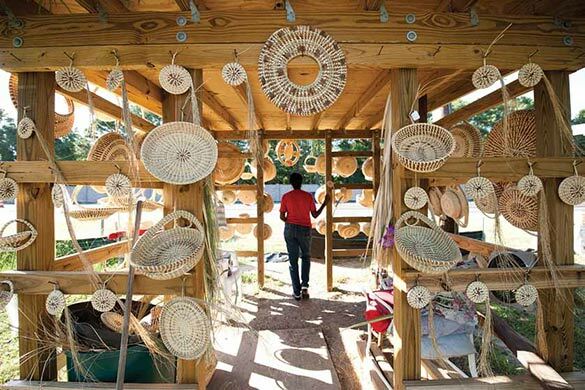 Roadside sweetgrass basket stands are the most visible aspect of the Gullah Geechee culture displayed along U.S. Highway 17. A portion of the highway was designated as the Sweetgrass Basket Makers Highway in 2006, the same year the sweetgrass basket became South Carolina’s official state craft. 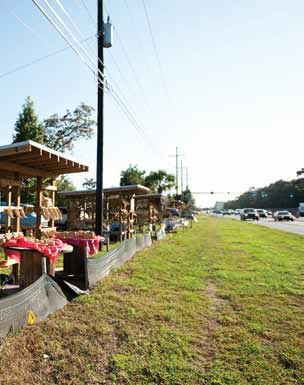 When planning for the U. S. Highway 17 North widening project began, and it became clear that many of the approximately 60 sweetgrass basket stands were going to be affected by the roadway improvements, the town of Mount Pleasant put together a comprehensive plan – with input from everyone involved. Town Council Member Thomasena Stokes-Marshall, executive director of the Sweetgrass Cultural Arts Festival Association, has been involved in the process. She explained how sweetgrass basket makers have been practicing their craft in the Mount Pleasant area for more than 300 years. It wasn’t until around 80 years ago, though, that the baskets spread beyond the Lowcountry. In 1931, when U.S. Highway 17 was first paved, a sweetgrass basket maker placed her chair along the road and started selling baskets. When others learned that passersby were stopping to purchase her wares, they followed her example. As the custom grew, some basket makers built stands on their own property in front of their homes, while others set up in the right of way at the edge of forestland. For more than 80 years, Mount Pleasant has grown around them. As they developed their properties, some landowners accommodated the existing stands, while others have constructed new stands for the basket makers displaced by new construction. “Mount Pleasant Towne Centre did a great job of building nice stands with designated parking,” said Stokes-Marshall in praise of the large shopping center located on U.S. Highway 17. The town’s new Sweetgrass Basket Overlay District along U.S. Highway 17 provides a transportation impact fee credit to encourage business owners to build and maintain wooden sweetgrass basket stands on their property, where safe parking areas are available for buyers and sellers. This ordinance passed the Town Council in October 2011. During the highway expansion planning, project engineers Collins Engineers Inc. and the environmental impact assessment contractor, Tidewater Environmental Services Inc., conducted a study of the stands, researching the history, walking the road, interviewing basket makers and holding public meetings. Access to the stands was highlighted as a concern. When the project is finished, every basket maker will be able to have a stand on Highway 17, with improved safety for customers getting on and off the road and parking,” said Stokes-Marshall. Sweetgrass basket maker and stand owner Marie Wine agrees. She has been temporarily relocated during the construction to a stand across from Boone Hall Farms, which is where she’d like to stay. The South Carolina Department of Transportation Commission presented Mount Pleasant with an Exemplary Human Environment Initiatives Award in June 2011 to commend its outreach to the sweetgrass basket weaver community during the project’s planning stages. “The town of Mount Pleasant has really gone above and beyond to ensure that those sweetgrass basket stands will be a permanent feature well into the future,” Stokes-Marshall concluded. The U.S. Highway 17 widening project reaches from the Isle of Palms Connector to Darrell Creek Trail. The $35-million town, county and federal project officially began in April 2011. The contractor, Gulfstream Construction, is also working on the I-526/Highway 17 interchange project. Both are expected to be completed early in 2013. For more information about the Sweetgrass Cultural Arts Festival: visit www.sweetgrassfestival.org.